I did this lesson in one 90 minute block period, but it was rushed at the end. Two 55 minute class periods would have been better. Last year equation solving in Algebra 2 was TRAGIC. This year I knew I had to change that. 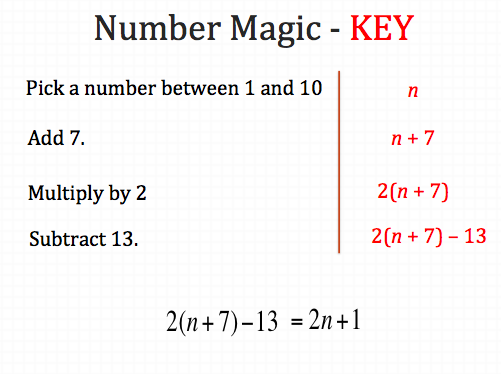 I decided to start with a concept that worked wonders in my middle school math classes, Math Magic. I found the idea on Dan’s blog long ago. I have them tell me their result, and then I tell them the number they chose by simply subtracting one from their result and dividing by 2. A few kids pick up on it right away, but many don’t. Next, I have them write down the “Pick a Number” directions using algebra. We talk about how they have to use a variable because everyone picked a different number. After they attempt this and share it with their partner, we talk about any errors. Some students will forget the parenthesis around 2(n + 7). I then give them an equation and tell them to develop the steps they would need to give this problem to a friend. 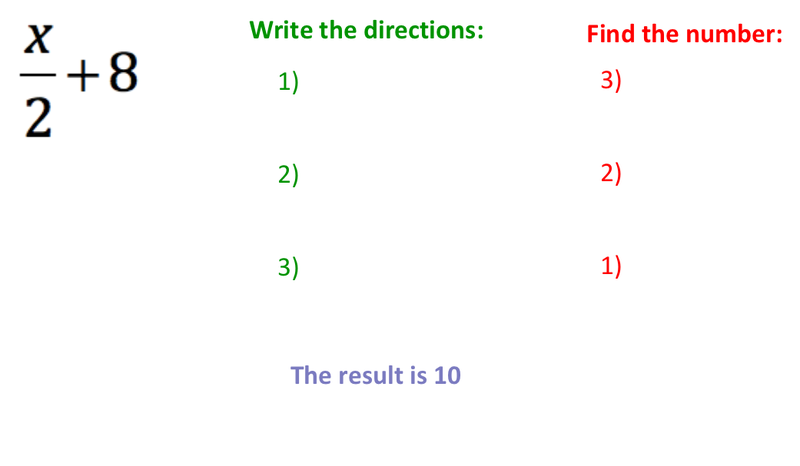 After writing the steps, I tell them the result, and see if they can work backwards to find the original number. I let them figure it out on their own, then encourage them to write out the steps. Next year I will give them more time with this. It would be great for them to come up with their own and share with others. Then, start the Glenn’s part on day 2. This year, after I did a few of these, I shared with them my three rules for solving equations, which I modified from Glenn’s blog. 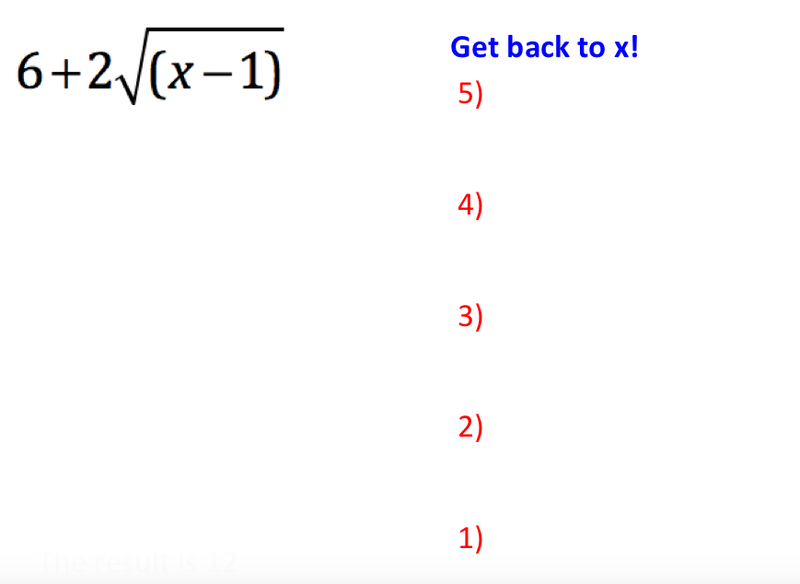 I had them make up a CRAZY equation by letting kids just shout out numbers and operations, and then challenged them to write all of the steps to get back to x. Their equation looked something like this. It took up the entire board to “undo” and was AWESOME. I then let them try one on their own that I made up. The challenge – get back to x! Once they write the steps to get back to x and confirm with their partner, I tell them the result is 12, and challenge them to find out what x is. I had kids ask if they could do it in their heads. In seconds, the entire class had the correct answer! Yes, they easily solved this, in seconds. After this, moving to literal equations was a breeze! I gave them a few easy examples of literal equations, making sure they were showing each step and explaining that they were using inverse operations to make 0 or 1 each step along the way. To practice, I put Glenn’s worksheet onto cards and did Meg’s Group Speed Dating Instructions. Like Meg, I gave each group of 3/4 kids two cards. They worked together to solve it and had a chance to ask me questions. Then I had two kids move around the room as partners and 2 stay at the table. For each rotation, the partners switched cards and solved each other’s questions. I told them they had to work with their partner before asking the other group any questions. Some of the questions were tough, but they really worked well together! 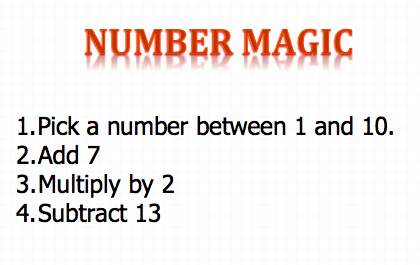 Number 1 was very easy, while number 6 was quite challenging for the students. I really hope that this makes complicated equation solving seem so much easier throughout the year for my students! My biggest draw back to this lesson was that we don’t move around until the last 20 minutes of the period. I would love to get them up and moving before the end as a 90 minute block gets very long about half-way through.